Offer 3 complete services and kill roots. Be the go-to Professional Drain Cleaner for your commercial and residential clients. With professionally applied RootX, you can guarantee pipelines are free from live root blockage for up to 12 months. After a year, RootX will generate reminders for registered customers to treat pipes annually and increasing your bottom line with repeat business. Pruned roots regrow, creating backups and damaging lines. 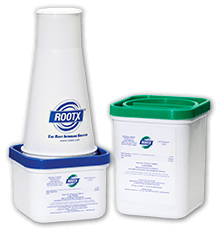 RootX is a patented formula that foams on contact with water, reaching the top of pipes where 90 percent of root growth occurs. RootX sticks to pipe walls, preventing re-growth for up to two years, helping pipes to keep operating at full capacity. RootX kills roots using aquatic herbicide Dichlobenil, a non-caustic, non-fumigating and non-systemic solution that will not harm pipes, septic systems or above-ground vegetation (Not for use on septic systems in the state of Florida). Effective for 10 years running and trusted by plumbers nationwide. Complete the Customer Registration card included with every RootX application. RootX will create a mailer sent to each of your customers with annual treatment reminders to contact you. RootX will also provide informative collateral to increase your visibility. All of this is free of charge.